One more phenomenon which has been linked to the global rise of temperature has been unearthed by scientists in Greenland. Despite the sub Zero temperatures in Greenland, scientists have discovered liquid water under the massive sheets of ice. The reservoir is huge and scientists once again label it as the indicator of Global warming. The study has been published in the Nature Geosciences journal. The huge underground water reserve and covers an area roughly the size of half the New York City. The reservoir is located on the land and is not much different from the structure of an underground aquifer. The reservoir was first discovered in 2011 when the Scientists from the University of Utah and the Byrd Polar Research Center at Ohio State University in Columbus, were extracting core samples from the surface layer. 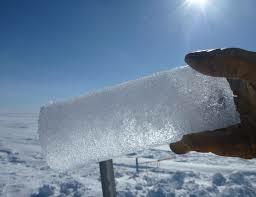 The aqueous layer of water lies just below the compacted ice layer in an area known as Firn. The scientists then used ground penetrating radars to peek below the surface and it was confirmed that there is indeed a huge reservoir of liquid fresh water. The fact was also confirmed by NASA’s Operation Ice Bridge flew over the area with a specially equipped aircraft. In fact the aircraft found that the reservoir extended far out beyond the area covered by the research team. Scientists can only hypothesize why the water remains liquid throughout the year. According to the hypothesis, summer melt water that has percolated down through layers of snow can remain in liquid state because the snow above it insulates it from the freezing winter temperatures. Snow by itself is a very bad conductor of heat. Scientists have to unravel the mystery about how the enormous aquifer affects the ice loss. Both possibilities have been studied- it could act as a lubricant and increase the pace of the ice loss. However the exact opposite is also plausible and it could slow the melt water which causes the sea level to rise. The speed at which the Greenland ice is being lost is very alarming and it has increased many times between 1993and 2005. According to the Intergovernmental Panel on Climate Change Ice loss was occurring at an average of 121 billion tons per year during that period and subsequently just doubled to 229 billion tons per year between 2005 and 2010. The last 20 years has seen the ice loss increasing the sea levels an average of 0.34 inches. Three successful heart transplant in a single family!